This project was the hardest out of what we did before. “Create a fabric or fabric items that can sense information that humans cannot sense (infrared, electromagnetic fields, toxic fumes, etc).” So, I had absolutely no idea what to do, however wanted to try airdrawing for a very long time. As it goes, I utilised the airdrawing in this project. Very simple yet very interesting. 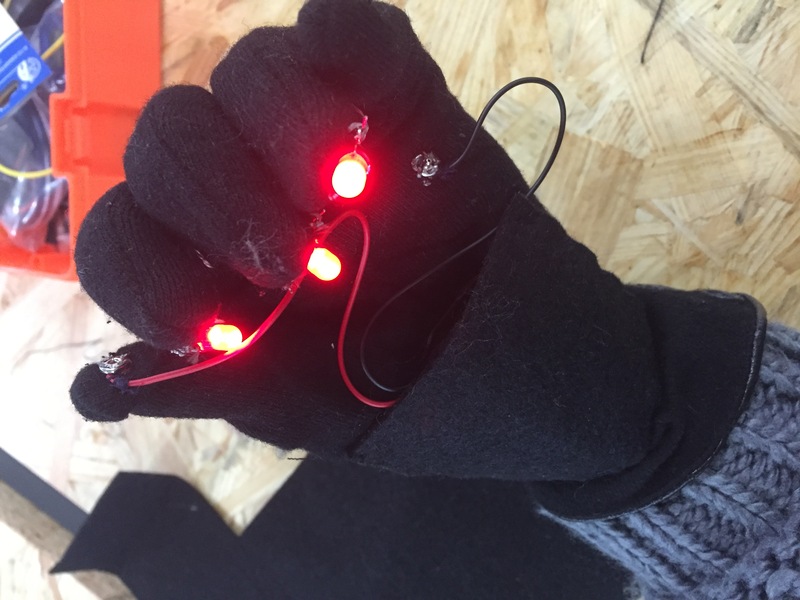 I first sewed the circuit with glowing LEDs to the glove so that is easier to draw. I think it is also a lot more interactive as you can move several fingers around the screen. The design can definitely more neat but so far this is what I’ve got: three leds connected between each other and powered by the battery. In order to make it more appealing, I sewed a little pocket for the battery. The clips are for the convenience purpose, so that it is easier to attach the battery’s wires. I used Processing for the drawing. To do so I had to explore video library along with learning how to work with pixels. The example code is screen capture, which uses computers pre-installed camera. For airdrawing I needed Processing to recognize the brightest pixels and follow it around the screen, so I needed to have shaded or dark environment and bright objects in order to draw. Obviously, LEDs are the brightest objects Processing is supposed to be recognizing in my project. Overall, I think the project turned out quite well, however there is a lot more to improve: glove design, also test on different LEDs colors and project them on the screen, so there are different colors to draw with. The end.